Did you have an N-Gage? I didn’t. They were shaped like tacos and I’m not very fond of tacos. The DS, on the other hand, is kind of shaped like a sandwich, or maybe some kind of candy bar. These are things I enjoy. This entry was posted on Wednesday, June 15th, 2011 at 12:00 am and is filed under Comics. You can follow any responses to this entry through the RSS 2.0 feed. Both comments and pings are currently closed. Was Tika actually hired, or is she just trolling the customers? I had an N-Gage…bad phone, worse game system, herald of things yet to come but wasn’t quite there yet. The best thing it had was a Java based OS that let you run all kinds of 3rd party apps… until it’s cheap little speakers blew out. …How did Tika get from behind the counter to right next to the customer so quickly? YES! 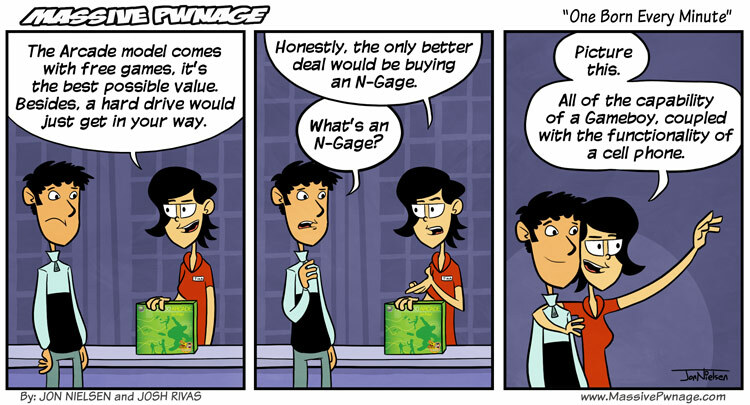 I remember the N-Gage. I wanted one so badly as a kid. I remember hearing a rumor that they would sometimes explode, were those true?